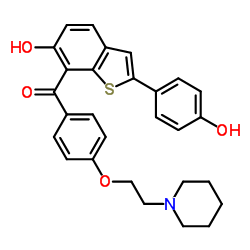 Raloxifene belongs to drug class of second-generation selective estrogen receptor modulator (SERM). It is used as a prophylactic treatment to prevent osteoporosis (thinning of bones) in women after menopause. It acts like estrogen and has estrogen agonistic effect on the metabolism of bone and cholesterol and at the same time it act on mammary gland and uterine tissue as an estrogen antagonist. Raloxifene does not use for the treatment hot flashes cause due to menopause but may cause hot flashes. It is most commonly known under the brand name Evista. Drug class: Raloxifene belongs to the class of organic compounds known as aryl-phenylketones, which are aromatic compounds containing a ketone substituted by one aryl group, and a phenyl group. Raloxifene is recommended for the treatment and prevention of osteoporosis in women after menopause. Raloxifene is indicated for reducing the risk of persistent breast cancer in postmenopausal women associated with osteoporosis. The risk of breast cancer was not completely eliminated by raloxifene. Before starting raloxifene treatment, patients should have breast examination and mammograms. Then start medication and should have regular breast exams and mammograms in keeping with good medical follow-up with continue treatment with raloxifene. After an assessment of the risk that breast cancer may develop, the decision regarding the initiation of raloxifene therapy should be based upon an individual evaluation of the benefits and risks. The reduction of breast cancer was shown in women of menopause. 27% of the participants received the drug for 5 years. The long-term effects and the recommended length of treatment are not known. There is no adequate data is available regarding the effect of raloxifene therapy in invasive breast cancer incidence in women with inherited mutations traits (BRCA1, BRCA2) to be able to make specific recommendations on the effectiveness of raloxifene. • Raloxifene is not indicated for the treatment of risk of recurrence of invasive breast cancer. • Raloxifene is not indicated for the reduction in the risk of noninvasive breast cancer. How raloxifene sjould be administered? Raloxifene is available in tablet dosage form in the strengths of 60mg per tablet. The recommended dose may differ for different patients. The mentioned dosage schedule is on average basis. Raloxifene is for oral use only (tablets) which can take with or without food. Adults—60 mg once a day, with or without meals. For the treatment and prevention of osteoporosis, because osteoporosis calcium and vitamin D is inadequate in daily diet so it is recommended to add calcium supplement with or without vitamin D supplement in a daily diet. In postmenopausal women average requirement of elemental calcium is 1500mg/day. High intake of calcium has not shown additional benefits for bones while very high intake of calcium of about 2000mg/day may cause associated adverse events, which includes hypercalcemia and kidney stones. The daily suggested intake of vitamin D is 400-800 IU. Patients who have vitamin D insufficiency need additional vitamin D supplements. Patients with gastrointestinal malabsorption syndromes higher doses of vitamin D supplementation and measurement of 25-hydroxyvitamin D should be considered. Raloxifene is contraindicated in women with an active or past history of venous thromboembolism (VTE), such as deep vein thrombosis, pulmonary embolism, and retinal vein thrombosis. In clinical trials, increase risk of venous thromboembolism (deep vein thrombosis and pulmonary embolism) was observed due the treatment of raloxifene in postmenopausal women. A less serious outcome, superficial thrombophlebitis, also has been reported more frequently with raloxifene than with placebo. 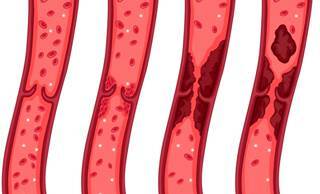 There was greatest risk of deep vein thrombosis and during the first 4 months of treatment pulmonary embolism occurs, and the magnitude of risk appears to be similar to the reported risk associated with use of hormone therapy. Because immobilization increases the risk for venous thromboembolic events independent of therapy, raloxifene should be discontinued at least 72 hours prior to and during prolonged immobilization (e.g., post-surgical recovery, prolonged bed rest), and raloxifene therapy should be continued only after the patient is fully ambulatory. In addition, women taking raloxifene should be advised to move about periodically during prolonged travel. The risk-benefit balance should be considered in women at risk of thromboembolic disease for other reasons, such as congestive heart failure, superficial thrombophlebitis, and active malignancy. Raloxifene is contraindicated during pregnancy, in women who may become pregnant, and in nursing mothers. Raloxifene can cause serious side effects when it is given to a pregnant woman. In pregnancy or in mother who can become pregnant, this drug should only be prescribed by keeping in mind the risk-benefit ratio to the patient and should inform patient the harm that may cause to a fetus by this drug. In animal studies, multiple dose-dependent serious problems occurred. Store the medicine in a closed container at room temperature and away from heat. Store in air resistant container to avoid moisture. Use amber color container to protect from direct light. Keep from freezing. Clinical trial shows that there is risk of coronary heart disease in postmenopausal women. There is also increased risk of death due to stroke was observed after treatment with raloxifene. Raloxifene should not be used in the patients with primary or secondary cardiovascular disease. There is no indication for premenopausal use of raloxifene. Safety of raloxifene in premenopausal women has not been established and its use is not recommended. Raloxifene should be administered with caution in patients with hepatic impairment. Safety and efficacy have not been established in patients with hepatic impairment. Limited clinical data suggest that some women with a history of marked hypertriglyceridemia (>5.6 mmol/L or >500 mg/dL) in response to treatment with oral estrogen or estrogen plus progestin may develop increased levels of triglycerides when treated with raloxifene. Serum triglycerides should be monitored in patient with this medical history. In renal impaired patient raloxifene should be used with caution. In moderate to severe renal impaired patients safety and efficacy have not been confirmed. Any unexplained uterine bleeding was observed as clinically indicated. Raloxifene-treated and placebo-treated groups had similar incidences of endometrial proliferation. Any unexplained breast abnormality occurring during raloxifene therapy should be investigated. Raloxifene does not eliminate the risk of breast cancer. Raloxifene has dual property. It acts as estrogen agonist as well as it also acts as an estrogen antagonist, while raloxifene is commonly referred as selective estrogen receptor modulator (SERM). Biologically, raloxifene shows its action by mediating through binding with estrogen receptors. In the result of this binding, in some tissues activation of estrogenic pathways (agonism) and in some tissues blockade of estrogenic pathways (antagonism) occurs. The agonistic or antagonistic effect of raloxifene depends upon the degree of employment of co-activators and co-repressors to estrogen receptor (ER) target gene promoters. In bones, raloxifene appears to act as an estrogen agonist. It decreases bone resorption and bone turnover, improves bone mineral density (BMD) and decreases the incidence of fracture. Preclinical data shows that raloxifene acts as an estrogen antagonist in uterine and breast tissues. These results are consistent with findings in clinical trials which suggest that raloxifene lacks estrogen-like effects on the uterus and breast tissue. Oophorectomy or menopause leads to the decreases in estrogen levels which lead to increases in bone resorption, decrease in Bone mineral density and accelerated bone loss. Lost in bones becomes rapid because the compensatory increase in bone formation is not sufficient to overcome the resorption effect or loss. Due to the low levels of estrogen, the balance between formations and desorption of bones become imbalance and this imbalance is age-related. Eventually, in many women, this leads to the decrease in bone mass, osteoporosis, and increase risk for fracture for fracture especially in spine, hips and wrist. The most common type of osteoporotic fracture is vertebral fractures in postmenopausal women. In both the osteoporosis treatment and prevention trials, raloxifene treatment showed consistent, statistically significant suppression of bone resorption and bone formation, and reflects by the change in serum and urine markers of bone turnover like bone-specific alkaline phosphatase, osteocalcin, and collagen breakdown products. The suppression of bone turnover markers was apparent by 3 months and persisted throughout the 36-month and 24-month observation periods. Treatment with either raloxifene or hormone therapy was associated with a reduction in bone resorption and a positive response in calcium balance. However, there was a small decrease in serum total calcium, inorganic phosphate, total protein, and albumin, which was less decrease as compared to hormone therapy. Platelet count was also decreased slightly and was not different from estrogen therapy. Effect of raloxifene for the treatment and prevention of osteoporosis was evaluated in 3000 postmenopausal women. Pharmacokinetic data also were obtained in conventional pharmacology studies in 292 postmenopausal women. Absorption: Raloxifene has a fast absorption after oral administration. About 60% of an oral dose is absorbed in the conjugate and can for presystemic glucuronide conjugation. The absolute bioavailability of raloxifene is about 2%. The time needed to achieve maximum plasma concentration and bioavailability depend on systemic interconversion and enterohepatic cycling of raloxifene and its glucuronide metabolites. Administration of raloxifene is increased with a standardized, high-fat meal, but does not lead to clinically meaningful changes in systemic exposure. Raloxifene can be taken with or without meals. Distribution: After oral administration of a single dose of raloxifene ranging from 30 to 150 mg o, the apparent volume of distribution is 2348 L/kg and is not dose dependent. Raloxifene and the monoglucuronide conjugates have a high (95%) plasma proteins binding. Raloxifene binds to both albumin and α1-acid glycoprotein. Metabolism: with the help of oral administration of 14C-labeled raloxifene, biotransformation and disposition of raloxifene in humans have been evaluated. Raloxifene face wide range first-pass effect or metabolism to form three main glucuronide conjugates: raloxifene-4′-glucuronide, raloxifene-6-glucuronide, and raloxifene-6, 4′-diglucuronide. No other metabolites have been detected, this gives the proof that raloxifene is metabolized by cytochrome P450 enzyme pathways. Non-conjugated raloxifene comprises less than 1% of the total radiolabeled material in plasma. This is consistent with interconversion of raloxifene and the glucuronide metabolites. Following intravenous administration, raloxifene is cleared at a rate approximating hepatic blood flow. Apparent oral clearance is 44.1 L/kg/hr. Raloxifene and its glucuronide conjugates are interconverted by reversible systemic metabolism and enterohepatic pathway, thereby prolonging its plasma elimination half-life to 27.7 hours after oral dosing. Excretion: Raloxifene is primarily excreted in feces and less than 0.2% is excreted unchanged in urine. Less than 6% of the raloxifene dose is eliminated in urine as glucuronide conjugates. During the clinical study trials and post-market surveillance some adverse effects were reported. Some are serious, some are moderate and some are rare. Of the total number of patients in placebo-controlled clinical studies of raloxifene, 61% were 65 and over, while 15.5% were 75 and over. Based on clinical trials, there is no need for dose adjustment for geriatric patients. Raloxifene overdose and its management? In an 8-week study in which 63 postmenopausal women were evaluated, and a dose of raloxifene used was 600mg/day and it was observed that 600mg/day dose was safely tolerated. In clinical trials, no raloxifene overdose has been reported. In post-market surveillance, raloxifene overdose has been reported very rarely (less than 1 out of 10,000 [<0.01%] patients treated). Even at a very high dose of 1.5gram/ day raloxifene was well tolerated and no fatalities was associated with raloxifene. While adverse reactions were reported in approximately half of the adults who took ≥180 mg raloxifene and included leg cramps and dizziness. Two 18-month-old children each ingested raloxifene 180 mg. In these two children, symptoms reported included ataxia, dizziness, vomiting, rash, diarrhea, tremor, and flushing, as well as elevation in alkaline phosphatase. There is no specific antidote for raloxifene. No mortality was seen after a single oral dose in rats or mice at 5000 mg/kg (810 times the human dose for rats and 405 times the human dose for mice based on surface area, mg/m2) or in monkeys at 1000 mg/kg (80 times the AUC in humans). Studies on women with a history of marked hypertriglyceridemia (>5.6 mmol/L or >500 mg/dL) in response to therapy with oral estrogen or a combination therapy with estrogen and progestin showed that they may develop increased levels of triglycerides when treated with raloxifene. Women with this medical history should have serum triglycerides monitored when taking raloxifene. Some reports showed that concurrent use of raloxifene and levothyroxine may interfere with the gastrointestinal absorption of levothyroxine. The mechanism of interaction is although unknown. Concomitant use of cholestyramine with raloxifene is not recommended. Because it is predictable that other anion exchange resins would have a similar effect. Raloxifene should not be co-administered with other anion exchange resins. If Raloxifene is given concomitantly with warfarin or other warfarin derivatives, prothrombin formation time should be monitored more closely during the raloxifene treatment. Raloxifene with other highly protein binding drugs like diazepam, diazoxide, and lidocain should be prescribed with very caution. Although potential of raloxifene to affect the protein binding of other drugs was not seen. Plasma protein binding of raloxifene is more than 95%.